Vs System® 2PCG™: The Alien™ Battles – They’re Coming Out of the Walls! A Xenomorph is a killing machine. Just one can wreak havoc on an unsuspecting group or colony, but the Xenomorph’s greatest weapon is their near unstoppable numbers. Swarm is a keyword that was introduced in the first Vs System® 2PCG™ set. It represents a characters ability to have multiple copies of itself in the fight at the same time. 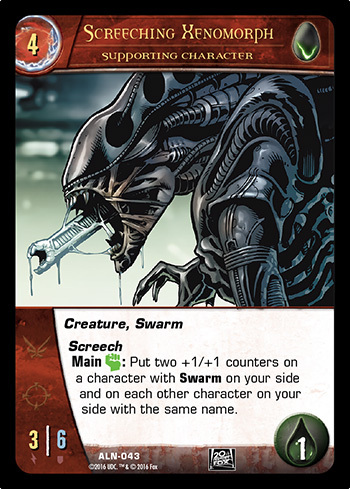 Almost every Xenomorph character has the Swarm keyword. Usually this means players can have up to four copies of that character under their control, but not always. 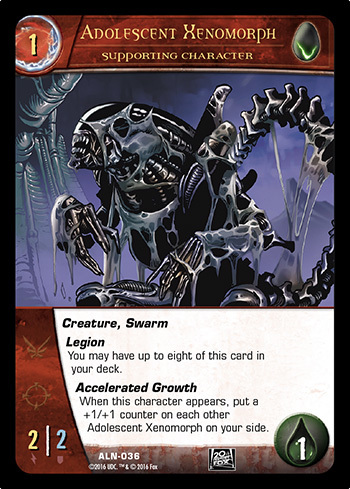 Vs System® 2PCG™: The Alien™ Battles comes with 8 copies of the Adolescent Xenomorph. Since the Xemomorphs have adapted to Swarm so effectively, they can use it to their advantage in a few ways. We hope you enjoyed today’s preview. Tune in next time for a look at something more synthetic. Vs System® 2PCG™: The Alien™ Battles releases this August. Contact your local gaming store to order your copy today.